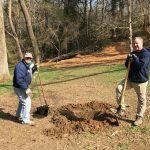 Home » Caretaking » Canopy Tree Plantings for Earth Day! 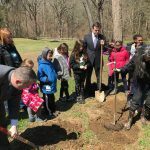 In honor of Earth Day, community volunteers, elementary school students, and local government officials worked together to plant canopy trees on the sledding hill in Glen Providence Park. 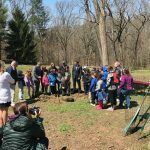 Thank you to The Rotary Club of Media, Media Providence Friends School students and teachers, Delaware County Council, and Delaware County Parks & Recreation for planting seven trees with Friends of Glen Providence Park this Wednesday! 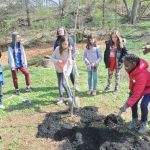 This winter, Media Rotary had reached out to Media Providence Friends School (MPFS) and Friends of Glen Providence Park about collaborating on an educational tree planting in the Glen for Earth Day. On March 2, when the iconic White Oak on the park’s sledding hill fell in a Nor’easter, we knew where we would plant! This beloved tree was estimated to be well over 200 years old, and the community profoundly felt its loss. As a part of succession planning for the loss of this and future trees, we planted six canopy trees – including four oak species which are particularly beneficial to wildlife – and a Flowering Dogwood to replace one that is nearing the end of its expected life. The native trees help control erosion, provide food and habitat for wildlife, and beautify the park. This supplements the two trees planted for Earth Day in 2015 after another large tree had fallen by the stage. 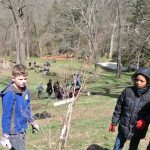 The species planted are White Oak, Black Oak, Chestnut Oak, Swamp White Oak, Black Gum, Black Birch, and Flowering Dogwood – we hope some of these saplings grow to be canopy trees that provide shade and beauty for future generations! 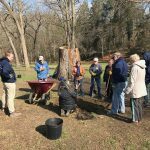 Volunteers from Rotary, MPFS, and Friends of the Glen worked together with Delaware County Parks & Recreation to organize the planting. Rotarians and Friends arrived early on Wednesday to prepare the site and start planting the trees. 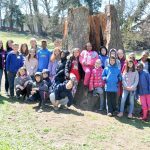 MPFS 3rd and 5th grade students helped dig the holes, plant the trees, mulch, and water – in addition to adding educational plant tags to our National Public Lands Day plantings from last fall! 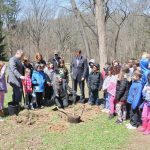 We were joined by Delaware County Parks & Recreation, and County Councilmen Michael Culp and Kevin Madden helped plant the final tree. 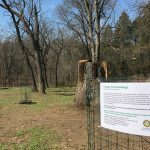 The Rotary Club of Media originated the idea, and the Media Rotary Foundation and Gundaker Foundation funded the native trees and the deer fencing to protect them. Media Providence Friends School is creating educational tree tags for these and last year’s plantings, and its teachers regularly use the park as an outdoor classroom to educate and inspire their students. 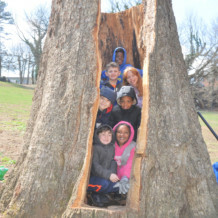 Delaware County Parks & Recreation provided the mulch, and a portalet so the students could extend their class time in the park. 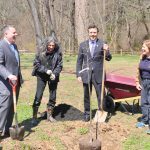 Delaware County Council helped plant the Chestnut Oak (in their suits!) and spoke thoughtfully about Earth Day. Seven Stones Cafe donated delicious coffee that fueled the early-arriving volunteers, and Pinocchio’s Restaurant donated enough pizza for the students and adults! Additional supplies were donated by AllScapes, Inc.; Honey Fix It, Inc.; and Pierce L. Shallis Landscaping & Design LLC. 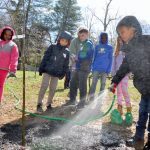 Last but not least, Garden Influence and Redbud Native Plant Nursery provided invaluable guidance on the best species to plant, and how to properly plant the trees. Check out the photos of the morning below!